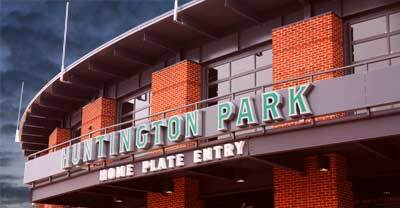 Professional baseball will be coming to the Arena District in 2009 with the completion of the new baseball field called Huntington Park. This new ball park will feature 3 levels with a capacity for 10,000 spectators, 32 suites, 42 loge boxes behind home plate, and club seats in the first row behind home plate. The ballpark will be located in the Arena District, on the northwest corner of Nationwide Boulevard and Neil Avenue in downtown Columbus. The first organized baseball club in central Ohio was the 1866 Buckeye Baseball Club of Columbus. They played their home games on a field located between the old Union Depot and High Street not too far from where the new Huntington Park is now located. However, the first game was played in a field near the asylum (about where I-71 crosses under E. Broad St. On that Saturday afternoon in April the Buckeyes played the Buckeyes with 2 teams made up of players from the same club. However, they weren't the only team in town. With the troops coming home from the Civil War, baseball teams sprang up all over the country as the "national game" allowed men to gather and compete against each other in a game they learned about from camp life during the war. Besides the Buckeyes, there was also the Capitals and the Excelsiors. In 1867 as interest grew in the new game, the Washington Nationals visited Columbus to play the Capitals as their first stop on a 10 game road trip. So much interest in the game was generated that they decided to play the game at Shiller Park. Even though the score was a bit lopsided (90 - 10) in favor of Washington, the game became a permanent part of the city's summer entertainment. The following year, the Capitals built their own ball field where today stands Olentangy Village. One prominent person responsible for generating interest in the national game was Civil War veteran James Comly, Editor and Publisher of the Ohio State Journal. Comly used his newspaper to promote news about all the baseball teams in Columbus. He was one of the organizing founders of the Capitals. As other cities sporting baseball teams increasingly began to rely on professional players, the Columbus clubs did not with predictable results. By 1873 attendance and interest for the lopsided games dropped off. In 1877 Jimmy Williams organized the International Association which would become the original Minor League baseball league. The city lost its franchise several years later because of the city's "blue laws" prohibited baseball games on Sunday. Over the next 20 years a number of teams would be formed and play. The first major ball stadium was called Red Bird Stadium home to a farm team for the St. Louis Cardinals from 1931 through 1954. The new stadium opened in 1932. In 1955 the team changed affiliations and name to become the Columbus Jets, a farm club for the Kansas City Athletics. The opening pitch for the new stadium was thrown out the first pitch at the new stadium. The affiliation with Kansas lasted only 1 year when they then became a AAA affiliate of the Pittsburgh Pirates. The stadium was renamed Jet Stadium. In 1971 the franchise moved from Columbus and for 6 years Columbus had no professional baseball. In 1977, the Columbus Clippers were born as an affiliate of the Pittsburgh Pirates, playing at a remodeled stadium Jet Stadium, renamed Franklin County Stadium. In 1979 the team changed its affiliation to the New York Yankees. In 1984 the ball park was renamed once again to Cooper Stadium (The Coop) in honor of Harold M. Cooper. Cooper had a long history with Columbus baseball. Starting out as a ball boy in 1935, he moved up through the ranks as a Clubhouse Manager and eventually a General Manager of the Columbus Jets. Later he would become a Franklin County commissioner. Harold Cooper was largely responsible for keeping baseball in Columbus during 1950s. In 2007 Cooper was elected to the International League Hall of Fame. 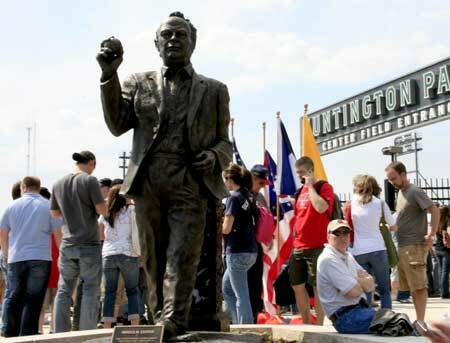 Statue of Harold M. Cooper, clubhouse manager, general manager, Franklin County Commissioner, International League President and namesake of Cooper Stadium, known kindly as "the Coop." The Clippers franchise was born in 1977 as an affiliate of the Pittsburgh Pirates, changing its affiliation to the New York Yankees in 1979. In 2007, the Clippers became the affiliate of the Washington Nationals and with the opening of the new stadium in 2009, the Columbus Clippers became the farm club for the Cleveland Indians. You can find out more about the history of baseball in Columbus at the Hall of Fame restaurant located in Huntington Park. The full service restaurant gives you great views of the game, but also interesting details on the history of the game in the capitol city dating back to 1876.